"I heard screams" of trapped passengers, said Jayan, a passenger on board the ill-fated Mangala Express that derailed in Maharashtra early Friday. "I was brushing my teeth when suddenly there was a loud noise," said Faridabad-resident Jayan who was travelling from Delhi to Kerala. He was in coach S-7. "Thank god I am safe" were Jayan's first thoughts. His wife Rini said that Jayan recalled the horror when he called her up early in the morning.She told IANS that Jayan jumped out of train and he "heard screams" of panic-stricken passengers who were in the coaches that went off the track. "Jayan told me that a large crowd had gathered at the site," said Rini. She is no longer able to access Jayan as his mobile battery has died down. Jayan's friend Krishna said they were now trying to move towards Nashik so that they can continue their onward journey. At least four passengers were killed and 50 injured as four bogies of the Nizamuddin (Delhi)-Ernakulam Mangala Express derailed early Friday, officials said. 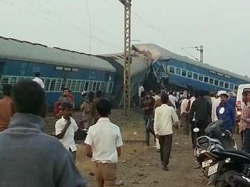 The accident took place around 6.30 a.m. in the ghat (hilly, winding) section of Nashik between Ghoti and Igatpuri stations on the Central Railway route.